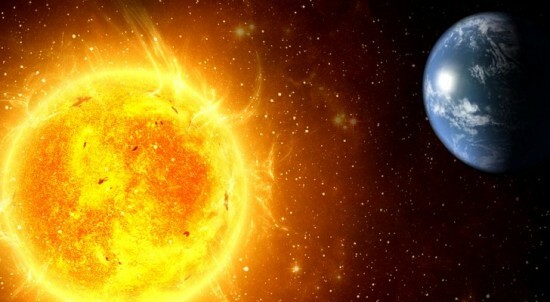 17 Interesting Facts About The Sun | OhFact! Our Sun is an oldie. It’s about 4.6 billion years old. When our Sun is 7 billion years old, then it will become bigger and will start to cool down slowly. From the earth, the Sun looks like a burning ball of fire. Actually, there are lots of activities going on inside the Sun. Every second, 5 million tons of energy, and 695 million tons of helium are released from 700 million tons of hydrogen! Now you know why the Sun is so hot. 3. A burning Ball of Gases! The Sun doesn’t have any solid surface. It’s just a ball of burning gases. Just like the Earth, the Sun also rotates on its own axis. But the interesting fact is that the Sun’s equator spins much faster than the Sun’s pole! One rotation of the Sun at its equator takes 27 days and at its pole takes 31 days. This is possible because the Sun is made up of gases. If its crust would have been solid like our earth, then this phenomenon would have been impossible. 5. We live inside the Sun! The Sun is not limited in the reddish-orange ball that we can see in the sky. Rather, its outer atmosphere extends to about 100 A.U., i.e., nearly 10 billion miles. So, our Earth exists within the outer atmosphere of the Sun. So, we are actually living inside the Sun! 6. Beware of The Sun’s Gravity! When compared with the earth, the Sun’s gravity is about 28 times stronger. 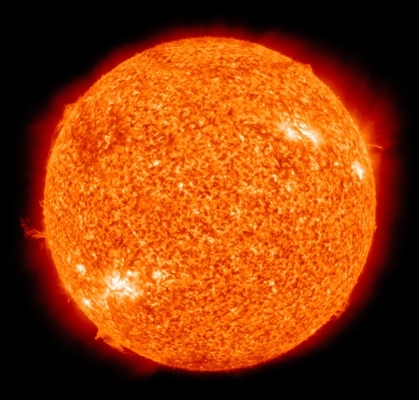 The gases inside the Sun moves continuously which is known as convection motion. This motion creates lots of noise, and these sound waves bounce continuously inside the Sun. We cannot hear the sound as these frequencies are too low. However, as per scientists’ interpretations, it would, somewhat, sound like a bunch of small-ringing-bells. 8. Overweight on the Sun! A person weighing 50 kg on the earth will weigh 1353.6 kg on the Sun. Imagine, what will be the weight of bodybuilders on the Sun. Why is it so? Simply, because of the massive size of the Sun compared to the earth. If the Sun is the size of a beach ball, the earth’s size will be as small as a pea. 9. What, If Sun vanishes? Do you know that if our sun vanishes, we would not know it for 8 minutes? The reason behind it is that it takes 8 minutes for sunlight to travel from the Sun to the earth. Calling our Sun dwarf is quite hard to imagine. 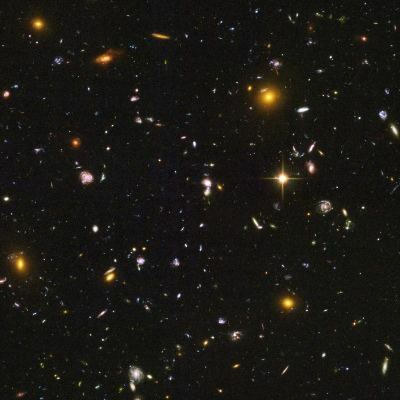 Well, the official definition of our Sun is “Yellow G2 Dwarf” because our Sun is just an average, a middle-aged star among the billions of stars present in the universe. Sun is a yellow dwarf star! Don’t worry Sun; to the universe you maybe dwarf but for us, the humans, you are like our big brother. Explosions occur in the atmosphere of the Sun when magnetic fields of the Sun come together. These explosions are known as solar flares, and they can reach about 100,000 miles away from the Sun. And the big news is that the energy released during solar flares is equivalent to the energy released when millions of 110 megaton hydrogen bombs explode at the same time. Thank God! There are no solar flares on the earth. Do you know that after every 11 years, the Sun’s magnetic field flips? The flipping of magnetic field means that the South Pole of the Sun becomes the North Pole and the North Pole becomes the South Pole. These flips are accompanied by explosions on the surface of the Sun, due to which, sometimes electrified particles may reach Earth. These explosions can also create disturbances impacting the power grids, GPS units, and flight communication. It’s true. Dark spots appear on the Sun’s surface due to low temperature and intense magnetic strength near that region. These dark regions are called Sunspots. You can count sunspots using a method called Wolf number, which was developed by Johann Rudolf Wolf. The next time you fret over dark circles or blemishes; just remember even the Sun isn’t immune from the dark spots. Whether it’s a myth or reality, no one knows, but some market analysts believe that sunspot and stock market are correlated. Some analysts believe that when sunspot activity increases, people start buying more, which causes a rise in the market. 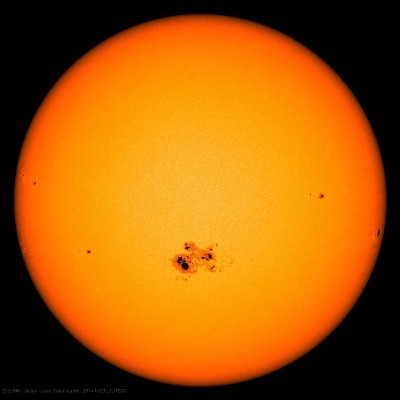 The vice versa occurs when sunspot activity decreases. Winds blow on the Sun too. But unlike the earth’s wind, its wind consists of electrons, protons, and other low-density particles. 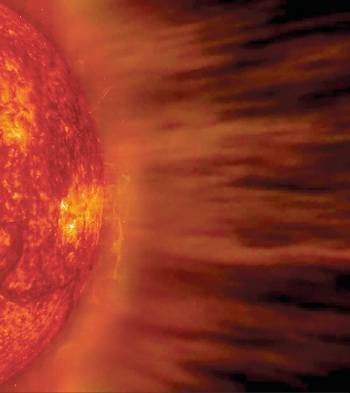 These winds are known as solar wind, and they have a speed of 450 km/hr. These wind particles do not affect human beings as our earth is protected by the atmosphere. The Sun had been burning for about 4 and a half billion years and had already burnt half of hydrogen in its core. So, the Sun will burn only for 5 billion years more. After that, the Sun will start swelling, engulfing even our dear earth and then die off as a small white dwarf. Our dark orange, the reddish Sun, can appear blue if it is viewed at 475-nanometer wavelength!